In the spring of 1989, Stanley Pons and Martin Fleishmann, in partnership with the University of Utah, claimed that they were able to create a fusion reaction in a test tube at room temperature. By the first week of May, 1989, the news had made the cover of Business Week, Time and Newsweek—the first time the same story had been on the cover of all three magazines since the Kennedy assassination. Clearly this was big news. There was a tremendous desire for this to be true: The Chernobyl disaster was still fresh in people’s minds having occurred a year previously, and the day after the press conference the Exxon Valdez oil spill occurred. People wanted to believe in the possibility of a cheap and abundant source of energy that didn’t create greenhouse gasses or radioactive waste. But before we get into the specifics of what happened, lets review what nuclear fusion is and how it works. Fusion is when two smaller atoms fuse together to make a larger atom. The most common form is hydrogen fusion, where two hydrogen atoms combine to form a helium atom, releasing massive amounts of energy in the process. This is what occurs in our Sun and in most stars. The benefit of fusion compared to its nuclear cousin, fission, is that it does not create any radioactive waste products. The downside is that it is much more difficult to create and contain. Hydrogen fusion itself can happen in several different ways, depending on the various isotopes involved. 99.98% of hydrogen has a nucleus with only a single proton (1H). 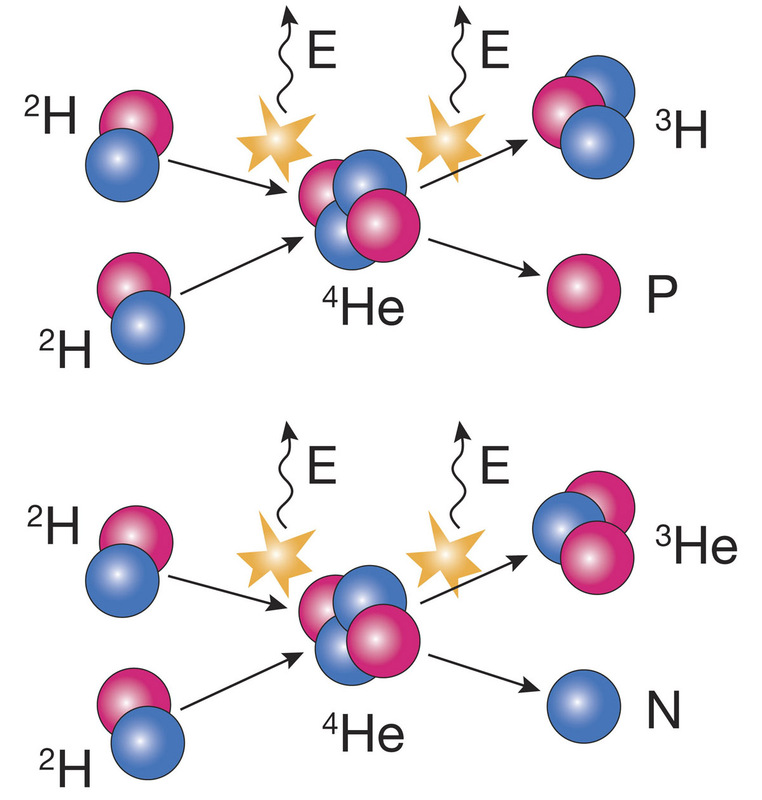 Deuterium (2H) is a stable isotope that contains one proton and one neutron in its nucleus and tritium (3H) is an unstable isotope that contains one proton and two neutrons. The process that fuels our sun combines deuterium and tritium to make helium. The nuclear process that was put forth as the mechanism for cold fusion used deuterium only, produced by running an electric current through heavy water (D2O). This causes the water molecules to split, liberating deuterium. The electrode in their experiment was made of palladium, which would then absorb the deuterium gas. Palladium has the uncommon ability to absorb up to 900 times its own volume of hydrogen at room temperature. The claim was that as the palladium absorbed the heavy hydrogen, its temperature shot up, and according to Fleishmann and Pons, created a net surplus of energy. So much energy, in fact, that during one experiment the water burned a hole in the beaker, the lab table it was sitting on top of and the floor below it. Check out part two where we talk about what happened after the press conference, and why cold fusion is considered pseudoscience today. 1) True or false: Palladium is able to absorb up to 800 times its own volume of hydrogen. 3) True or false: Hydrogen fusion does not create radioactive waste. 4) Water that contains deuterium instead of hydrogen is called _____________. 5) The unstable isotope of hydrogen that combines with deuterium to power our sun is called ____________. Hey Doug, nice write up.